Russian sage (Perovskia atriplicifolia) is a deciduous woody perennial or subshrub with strongly scented gray-green leaves, silvery gray mostly upright stems, and masses of tiny lavender-blue to deep blue flowers on tall spikes from summer through fall. A fine-textured plant two or three feet tall and wide with an open, airy habit, perovskia is content in full sun with only occasional deep summer watering. It thrives in almost any soil type, including clay, but must have decent drainage; it sulks and rots where drainage is poor, especially in rainy winters. Native to rocky steppes of southwestern and central Asia from Afghanistan to Tibet, perovskia accepts both heat and cold and is exceptionally long blooming. Flowers appear along with lavenders, sages, achilleas, and monkeyflowers, then continue on, to the great delight of bees and butterflies, long after most companion plants have settled into end-of-summer dormancy. In my garden plants are completely ignored by deer, undoubtedly because of the pungent fragrance of brushed, trampled, or nibbled leaves. Perovskia flowers only on new growth, so plants should be cut back before the next flowering season. Pruning is key to success with this otherwise easy and adaptable plant. If you don’t cut back, flowers will be sparse. If you cut back too little, plants may be lax and floppy. If you cut back too early, plants may die. It seems best to wait until new growth begins to appear in spring, then cut back to six inches or a foot above the ground. Some seed-grown plants are said to sucker ferociously, gradually taking over large swaths of adjacent territory. 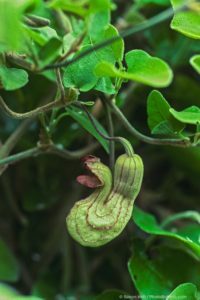 While one could control rampant spread by chopping out suckers as they appear, it’s easier to plant only cultivars known for little suckering. ‘Blue Spires’ is a vigorous grower, to four feet tall and wide, with deep blue flowers. ‘Lacy Blue’ is compact, a foot and a half to two feet tall and wide, with lavender-blue flowers. 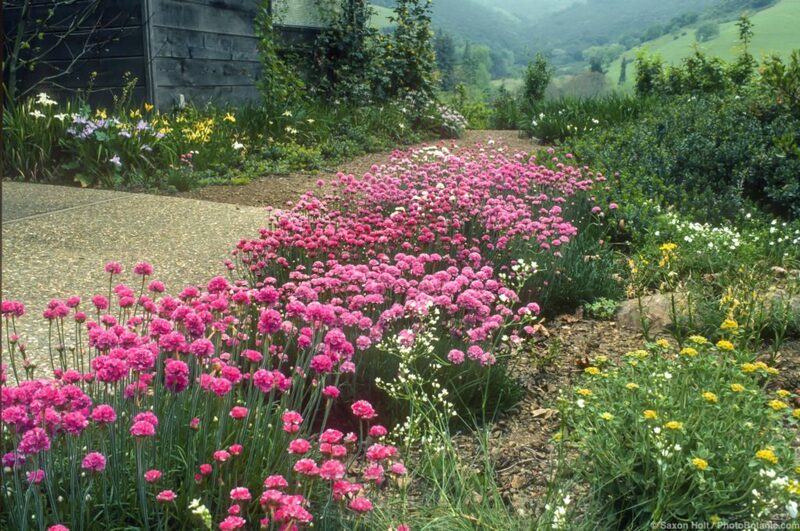 Sea pink or sea thrift (Armeria maritima) was once more commonly found on “drought-tolerant” plant lists than it is today. Gardeners who were led to plant it no doubt discovered that it just doesn’t thrive without summer water or afternoon shade except right along the coast. Sea pink is nonetheless perfect for small gardens or small garden areas where a little summer water can be spared. Its densely hummocky cushions of evergreen grassy leaves are six inches tall and spread to about a foot wide. Pink or sometimes white flowers cover the plant from late spring to early summer. Native to coastal areas of northern Europe and the Mediterranean, sea pink is also found in western North and South America. It prefers good drainage and grows well in sandy or rocky soils as well as in clay. Use it in rock gardens, in fast-draining containers, or between paving stones in close-up areas where you want a colorful accent. It is best in part shade inland, full sun along the coast. The subspecies californica is native to central and north coastal California and is present but uncommon along the south coast. Achillea millefolium is a variable perennial, with one kind or another found throughout temperate regions of North America, Europe, Asia. California has several native kinds of A. millefolium, but the most widely available and commonly planted achilleas, such as the canary yellow ‘Moonshine’ or golden yellow ‘Coronation Gold’, are named hybrids or selections of other species or of plants originating elsewhere. You may have to seek out the lovely long-lived white- to pink-flowered native achilleas at native plant sales or nurseries that specialize in California natives. Achilleas have lacy, finely divided, aromatic, green to gray-green leaves and small daisy-like flowers in compact flat-topped clusters. Grown in full sun, plants form dense mats six inches to a foot or so tall with masses of flowers on stalks a foot to three feet tall, showy for months in late spring through summer. Blooming can be prolonged into fall by removing spent flowers before they go to seed. Easy, vigorous, and adaptable, achilleas spread by underground rhizomes, less so by seed, and may be considered invasive in orderly gardens. Dig deeply, divide, and replant if clumps begin to spread beyond where you want them to grow. Plants are better behaved with restricted summer watering, though occasional water will improve their appearance in inland areas. 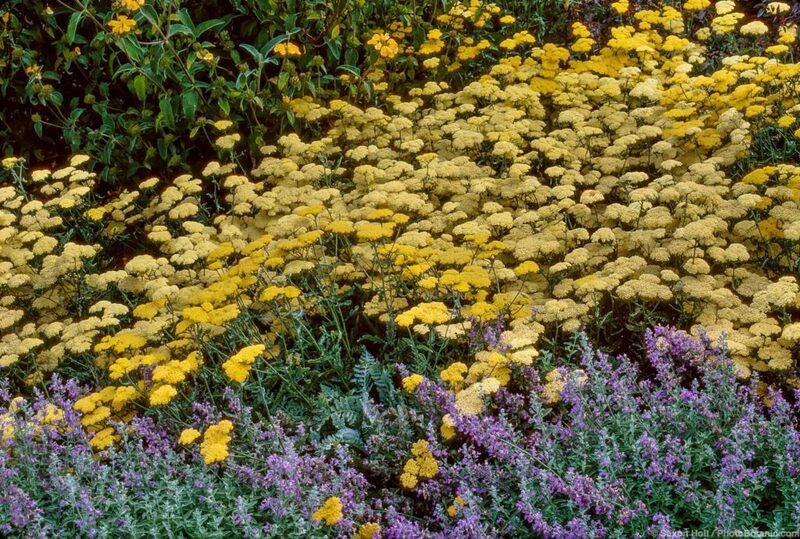 Achilleas make a fine accent or harmonizer and are especially effective in meadow gardens with mounding or spiky grasses or mixed with other perennials. 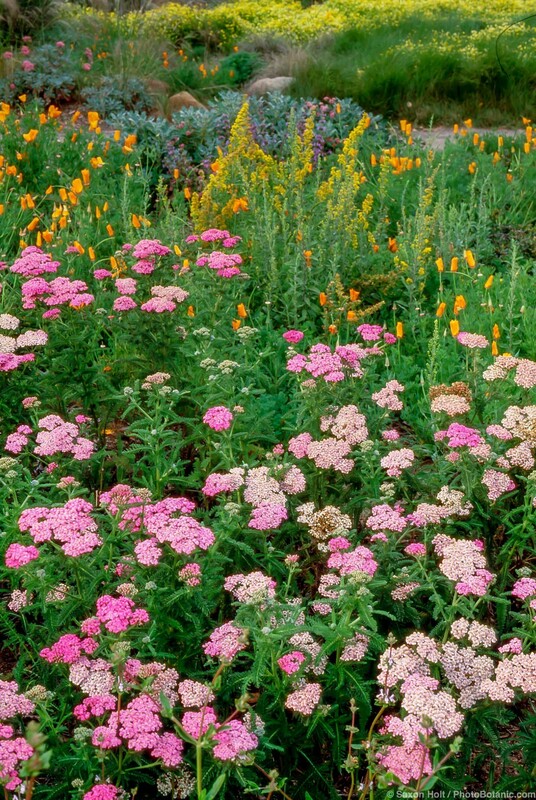 Named cultivars of Achillea millefolium come in a wide range of colors that change subtly with age. Mid-season flowers feature a pleasing combination of varying shades of white, pink, salmon, lilac, orange, crimson, or purplish red, turning buff-colored and then tawny brown as seeds mature. Flowers are irresistible to butterflies and attractive in both fresh and dried arrangements. Birds feed on the foliage in winter. Seemingly undeterred by the rather strong fragrance of the leaves, deer often browse the flowers. Plants that are dormant or not actively growing during the hottest months are well adapted to summer-dry climates, including many California natives. Irises, both native and not, are a beautiful choice. Douglas iris (Iris douglasiana) forms an upright clump of sword-shaped or grasslike green leaves, mounding and spreading with age by underground rhizomes. Flowers are blue-violet, deep purple, or occasionally white, often two or three on each upright stem in late winter to mid-spring. 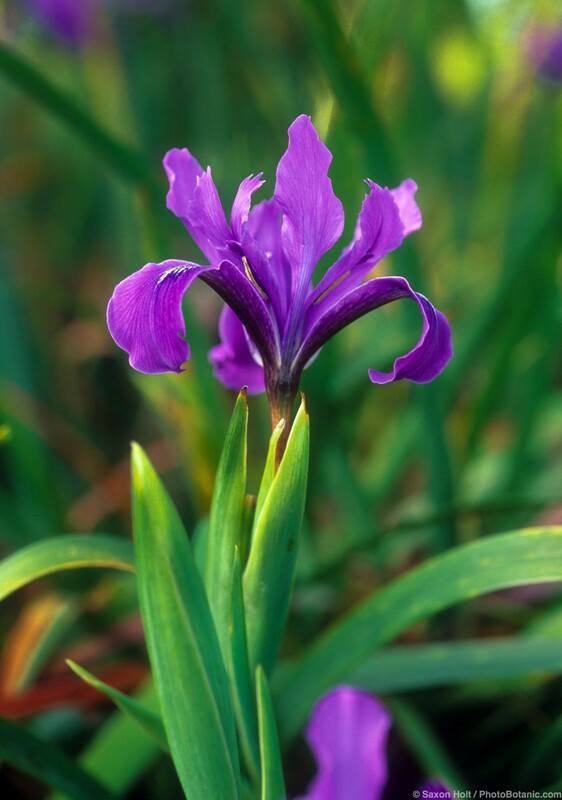 Native to coastal California and Oregon, this Pacific Coast iris happily tolerates summer dryness in sun near the coast or inland in part shade. Most leaves will die back in summer but return with fall rains. Deer ignore this plant and its many named varieties. One of the most garden-tolerant and easily grown named Pacific Coast irises is ‘Canyon Snow’, with bright white flowers with golden yellow markings at the base of each petal. Wide-spreading clumps of glossy green leaves are covered with flowers on foot-tall stems in early spring. Plant in late fall, when new growth starts, usually after the first rains. Good to excellent drainage is essential; best massed on hillsides or planted on earth mounds or in raised beds. 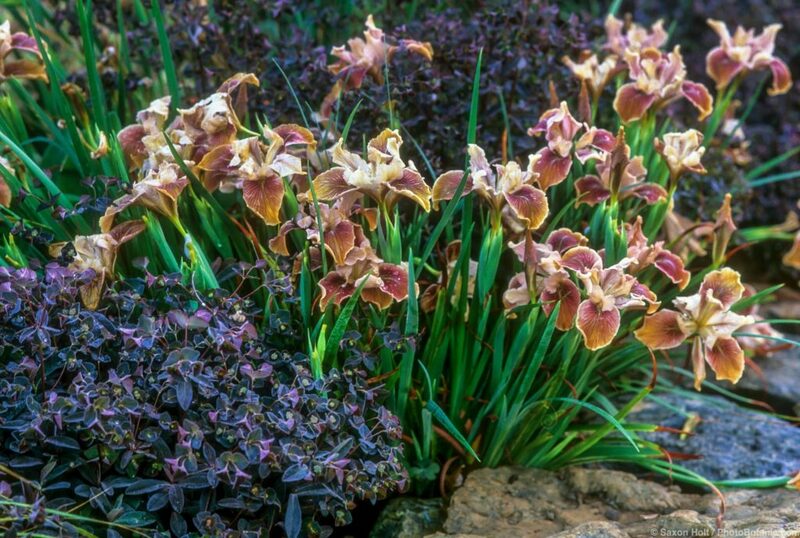 Bearded irises are another great choice for summer-dry climates, though they are not native to California. 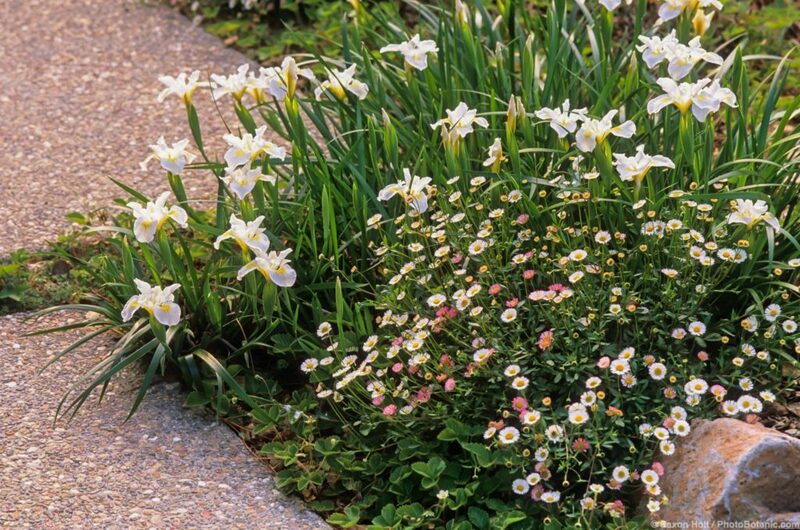 They do benefit from dividing occasionally, at least every four or five years, but they thrive with little or no supplemental watering, even during droughts. They may not bloom as heavily without winter rains, but they return with vigor when the drought subsides. Bearded irises are particularly long lived. A small group of old-fashioned yellow-flowered plants have persisted in my garden since I arrived, thirty-five years ago, without dividing and with no supplemental water. Another bearded iris, with deep purple flowers, I found here the same year, distributed randomly all over the property. I have gathered them together in one eye-popping display, dividing occasionally but otherwise providing no water and no care. Lavenders are so at home in California that it’s hard to believe they’re not native here. Lavenders have green to grayish green or silvery gray, narrow, softly toothed or smooth margined aromatic leaves and upright stems of tubular lavender, purple, pink, or white flowers. There are many species and dozens of named varieties in the trade. The best known and most widely grown is English lavender (Lavandula angustifolia), a woody perennial subshrub, two to three feet tall and four feet wide, with long, narrow, silvery gray, softly downy leaves and airy spikes of pale lavender flowers in summer. 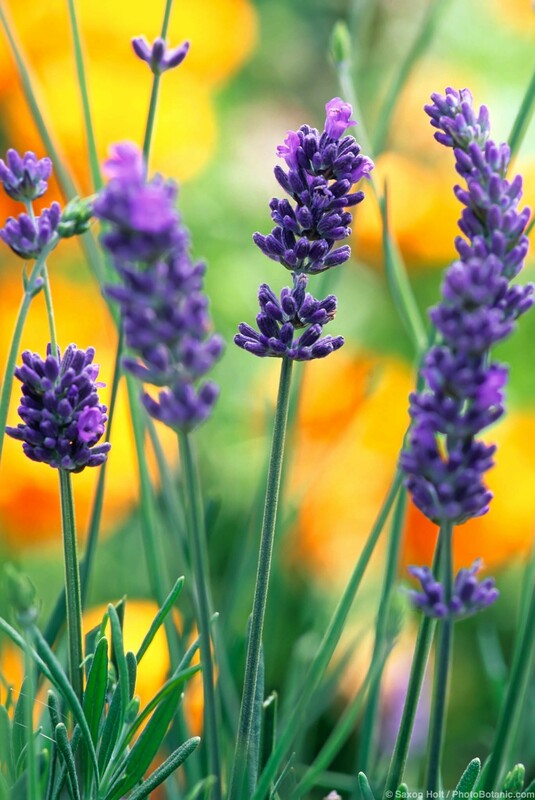 Most English lavenders available today are cultivated varieties. ‘Hidcote’ is smaller than the species, one to two feet tall and wide, with rich blue-purple flowers. ‘Hidcote Pink’ has pink flowers. 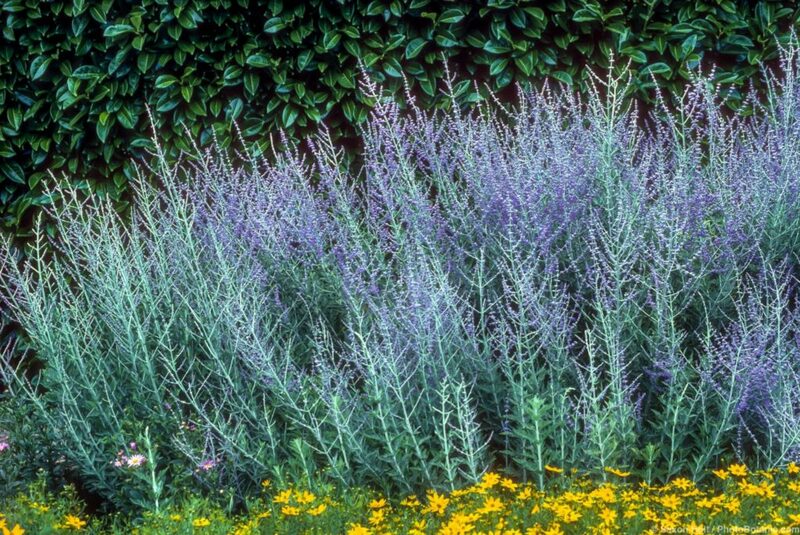 ‘Munstead’ is a dense and rounded shrub, 18 inches tall by two feet wide, with lavender-blue flowers and gray-green, smooth margined leaves. A vastly different lavender, commonly available in nurseries today, is Spanish lavender (Lavandula stoechas). This is not your grandmother’s lavender. It is much chunkier in bloom, way more “look at me” than other lavenders that blend subtly into garden compositions. Spanish lavender, sometimes called French lavender, has downy gray leaves and blooms from spring to fall in warm climates. The tiny purple flowers are borne on cone-shaped heads topped by outrageously prominent feathery pink to purple bracts. There are many named varieties of Spanish lavender, including ‘Otto Quast’, one to two feet tall by two to three feet wide, with tiny dark purple flowers and pinkish purple bracts, and ‘Alba’ with creamy white flowers. Lavandula x intermedia supposedly has the common name of lavandin, but no one I know calls it that. This plant has broader leaves than most lavenders and bears flowers on long stems from summer to fall. The lavandin variety ‘Grosso’ is two to three feet tall and wide, with unusually fat flowering heads and dark violet-blue flowers. ‘Provence’ bears lavender-blue flowers on long stems. French lavender (Lavandula dentata) is three feet tall by four feet wide, with narrow green leaves, toothed on the margins, and compact heads of pale lavender flowers on short stems. ‘Goodwin Creek Grey’ is a fine-looking hybrid of French lavender, two feet by three feet, with exceptionally silvery leaves and grayish lavender flowers. 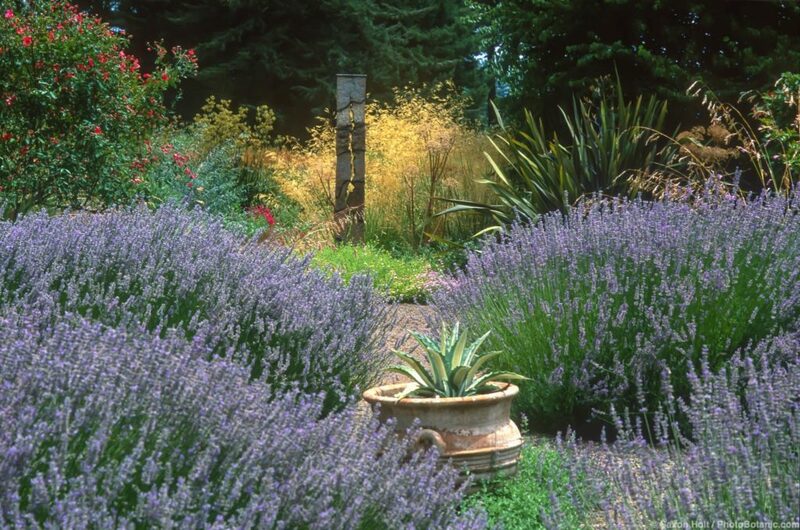 Lavenders naturally become woody and rangy over their otherwise long lives. If you want to keep them dense and mounding, you should treat these shrubs as kitchen herbs, which some, but not all, of them are. Cut plants back the first year after flowering. Continue to “harvest” every year, cutting back up to a third of new growth for maximum flowering and to maintain the mounding habit. Replace plants that become lanky or unkempt, usually after four or five years. Plant in full sun, provide decent drainage, don’t overwater in summer, and don’t fertilize. 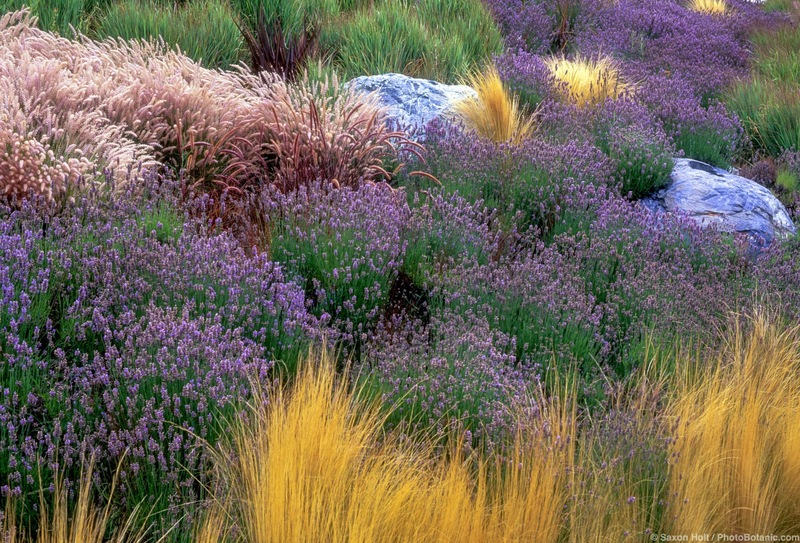 Bees, butterflies, and hummingbirds are attracted to lavenders, while deer generally avoid them. Gardeners in summer-dry climates often seek out plants that when fully established can survive without any supplemental water. 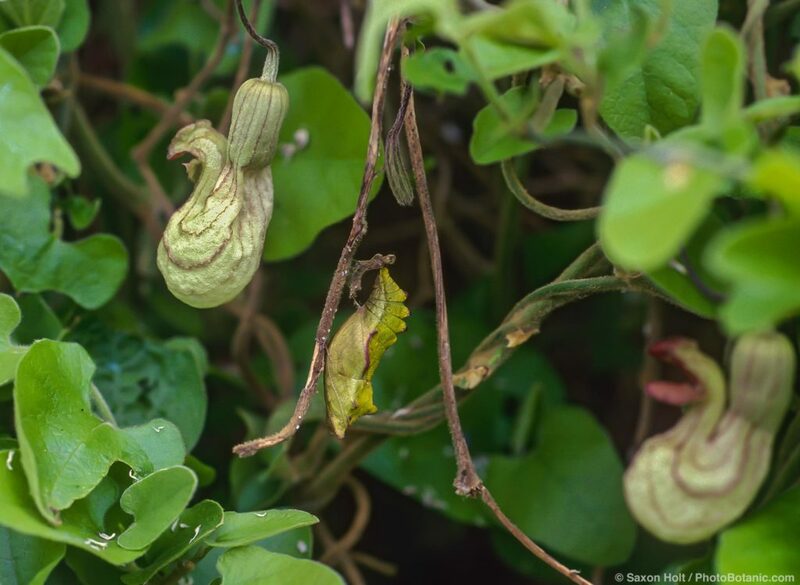 This may require some tolerance for the dried-out appearance that many of these plants take on in late summer as they hunker down to make it through to the next rains. 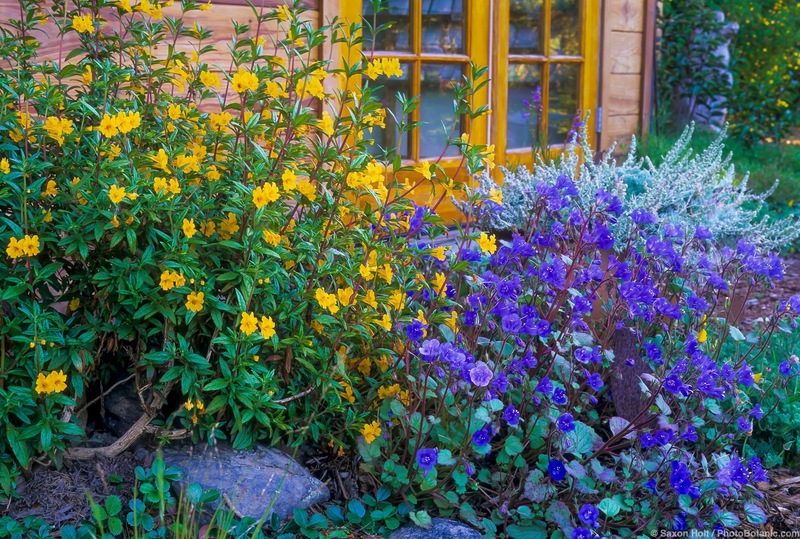 Bush monkeyflower or sticky monkeyflower (Mimulus aurantiacus) is a natural candidate for summer-dry gardens that feature the colors of California. This is the deep orange to yellow-orange flower that, along with lavender lupine and bright orange poppies, graces California roadsides, parklands, and open spaces from spring into summer. Tolerant of considerable dryness, bush monkeyflower goes semi-dormant in late summer or early fall, losing most of its leaves if unwatered. It may look more acceptable to passersby if you water it sparingly, but in all but the driest years it will get by with none. Bush monkeyflower prefers excellent drainage and thrives on slopes or mounds or in rock gardens where excess winter rains drain quickly away. Some afternoon shade is appreciated, especially in inland gardens. An erect to sprawling woody perennial native to open hillsides and rocky outcrops throughout much of California, the long-lived, long-blooming bush monkeyflower is still sometimes called Diplacus, a former name that clearly distinguished it from other monkeyflowers (Mimulus species) that prefer regular summer water, rich soils, and some shade. 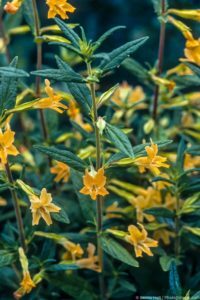 Upright or mounding from one to four feet tall and two or three feet wide, with glossy, narrow, sticky green leaves, bush monkeyflower tends to get leggy without yearly tip pruning and will accept a fairly hard cutting back. Butterflies and hummingbirds flock to it and deer usually ignore it. Nurseries carry many cultivars and hybrids with flower colors ranging from creamy white to peachy orange and bright red.